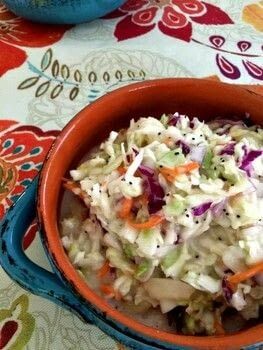 Creamy Coleslaw · How To Make Coleslaw · Recipes on Cut Out + Keep · Recipe by Lisa K.
100% delicious! The poppy seeds add a new dimension of goodness to this coleslaw. This creamy coleslaw keeps its crunch and has a slightly sweetened, vinegar spiked mayonnaise dressing. The recipe is super simple to put together and is perfect for all of your Summer BBQ menus or every day side dish. 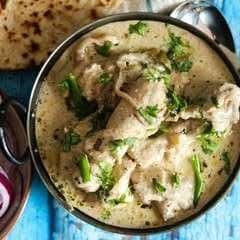 Takes only a couple of minutes to prepare and then chill in refrigerator for a couple of hours so that all of the flavors meld together. In a large mixing bowl,combine the coleslaw mix and diced red onion. In a small bowl, whisk together the salad dressing, oil, sugar, vinegar, salt, and poppy seeds until well blended. Pour dressing mixture over coleslaw mix and toss well to coat. Chill for at least 2 - 3 hours before enjoying.